6-hours lights off (crops sleep) Lumens Principle is Cure4Hunger light to be 12-24 inches from crops to light depending on growth stage. 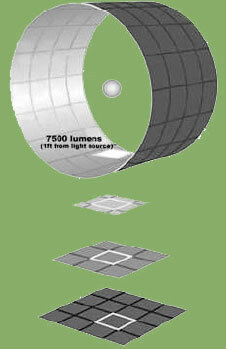 Cure4Hunger Advantage consuming Lumens Principle Light Source and Crops-Growth Relationship uses the precise lighting distance to the crops for maximum health and strength. The scientific method principles are the same as the “inverse square law” – any physical law stating the specified physical quantity strength is inversely proportional to the distance of the crops rotating inside the Robotic Gravity Garden System. Adding gravity rotation produces an exponential result combining perfect amount of light, gravity, and nutrients creating the most natural and 100% organic fruits and vegetables per square feet in recorded history. Once Cure4Hunger Dome is built, it produces food and water day after day, year after year, decade after decade. No matter how dry, windy, wet, hot or cold outside, Cure4Hunger Domes keeps crops safe and secure inside for people to live sustainable lives.Construction of a Cure4Hunger takes less than 30-days due to the ease of design and half the cost of a traditional building with 50-75% more energy efficient. These domes maintain the best environment (temperature and humidity) more effectively and affordable than any other indoor farm. 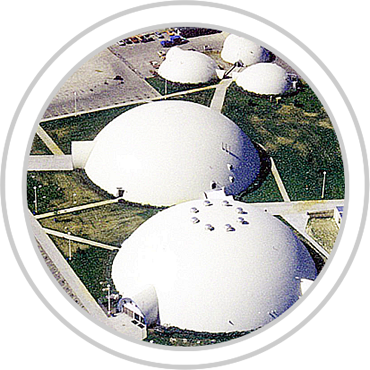 Within 15-20 years the energy savings pays for the entire cost of the dome.Each disaster proof grow dome comes with a 100-year warranty and can withstand any F5 Hurricane or Tornado up to 400mph. 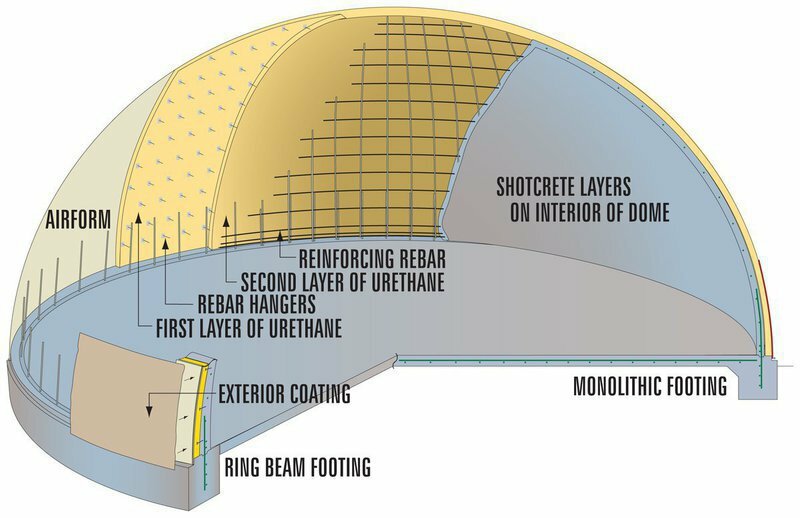 Domes are also fire proof, bullet proof, termite proof, flood proof, reflects EMP’s and has an anti-liquefaction option for earthquake regions around the world. 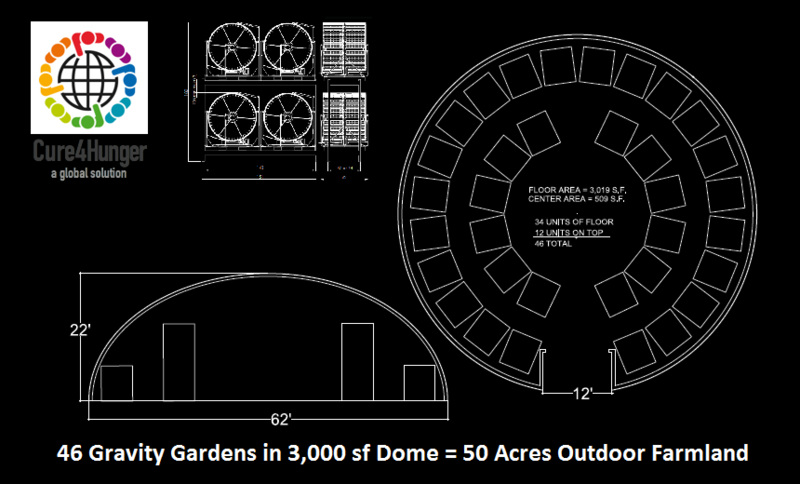 Cure4Hunger has a 10-year OEM License Contract with SafestHouse to build these disaster proof domes at cost plus 3% royalty license fee.Cure4Hunger’s innovative game changing invention grows unlimited crops safe and securely indoors regardless of the outside environment. More than 450 cities worldwide have populations of more than 1-million people. Build a 50-Story Robotic Farm Tower and produce 200+Million pounds of fruits and vegetables annually from just 20,000 square feet of downtown land. Once a Robotic Farm is built, it produces money and food at the same time day after day, year after year, decade after decade maximizing harvests while using very little land and water to produce abundant food. Cure4Hunger is charted to build thousands of grow domes in 150 nations providing fruits, vegetables and fish in these domes including providing fresh drinking water via water atmospheric generators, which harvest 1,320 to 5,000 gallons of fresh drinking water daily via Technology Partner: EcoloBlue.com. 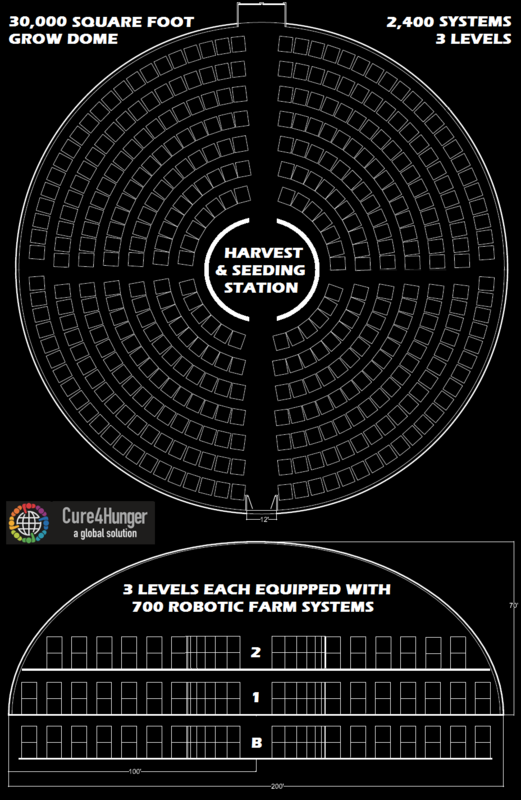 Cure4Hunger has exclusive global manufacturing rights to these Robotic Farms patented systems as Cure4Hunger Gravity Gardens with the inventor of patented technology receiving royalty fees including OEM Technology Partnerships with EcoloBlue and Safest House. The United Nations Food and Agriculture Organization estimates that nearly 870 million of the world’s 7.1 billion inhabitants, or one in eight, suffered from chronic undernourishment in 2010-2012. The majority of the world’s hungry population live in developing countries. Cure4Hunger Food and Water Domes can be built anywhere in the world all paid for through profits of Cure4Hunger contracts with national and global food service retailers and distributors thus making this the world’s first legitimate cure for hunger in more than 150 nations. The three key elements of nitrogen (N), phosphorus (P), and potassium (K) are essential to all plant growth. There are also about 10 trace elements that are essential component of the required nutrients. Nitrogen Phosphorus Necessary for the production of leaves and stem growth; Also an essential ingredient in building plant cells. Potassium Required in the development of flowers and fruits and aids in the growth of healthy roots. Sulphur Assists in the production of plant energy and heightens the effectiveness of phosphorus. Iron Vital in the production of chlorophyll. Manganese Aids in absorption of nitrogen, an essential component in the energy transference process. Zinc An essential component in the energy transference process. – Needed in the production chlorophyll. 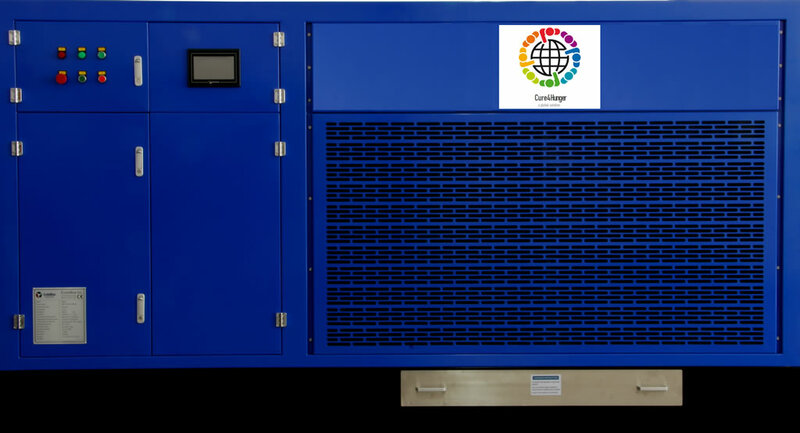 – Required in minute amounts, but involved in the process of distributing phosphorus throughout crops. Copper Boron Magnesium Encourages the root growth and helps plant absorb potassium. Calcium Chlorine Molybdenum – Required for photosynthesis. – Assists in several chemical reactions. Cure4 Hunger has an OEM Agreement with Technology Partner: EcoloBlue for their industrial size systems, which produce 1,320 to 5,000 gallons of fresh drinking water daily for local communities without water and to water the Cure4 Hunger Domes.Part of the cure for global hunger has to do with national or global food service providers as Cure4Hunger can build Food Domes at their distribution centers thus saving 20% of their total expenses eliminating transportation and import costs. 90% of all profits goes towards building duplicate domes in famine regions of the world. Cure4Hunger is the only company in the world that can guarantee delivery to national or global food services providers any quantity of 3,000+ fruits, vegetables, plants, trees and flowers at 20% lower price than their last 3-year average price and can price protect for 10-years with a contract. Cure4Hunger then builds the Dome as close to their distribution center(s) eliminating import and transportation / delivery costs. . Using 1-million times less water than traditional outdoor farming, a single 8×5 foot system can grow an equivalent up to 1-acre of outdoor farmland typical annual harvest.Each system grows 420 Crops which rotates ever hour and 7-minutes the wheel does a complete cycle. 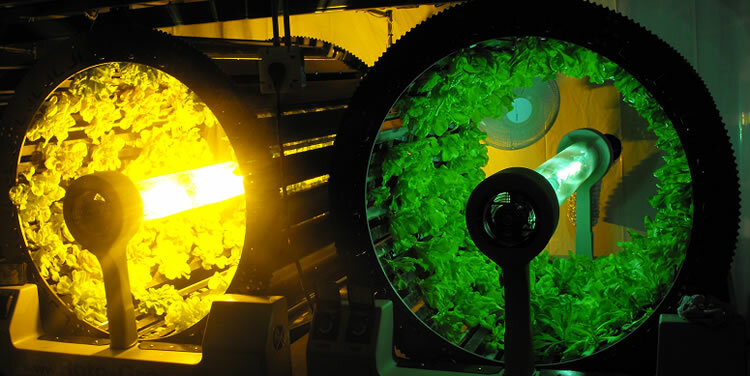 Add gravity to agriculture was the missing link to make farming extremely affordable using up to 27 times less lamps than traditional indoor “hydroponic growing”. 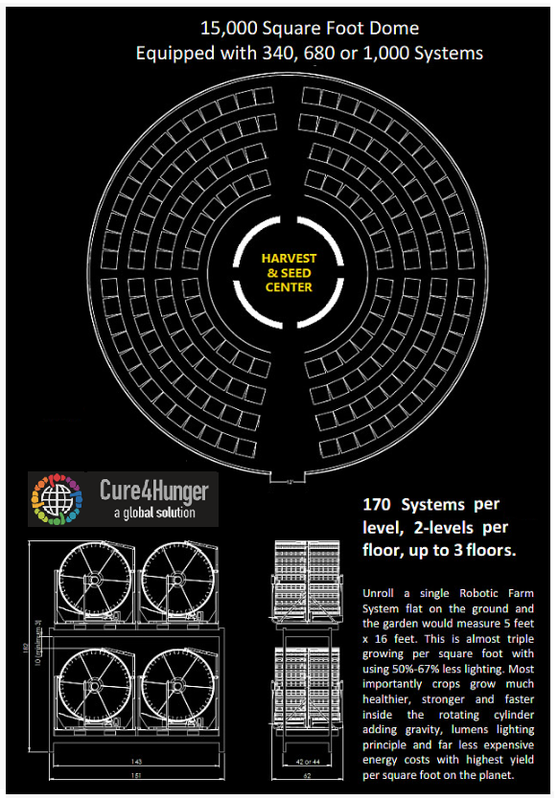 Cure4Hunger Gravity Gardens wraps 16 feet long and 6 feet wide of 420 crops slots into a wheel. 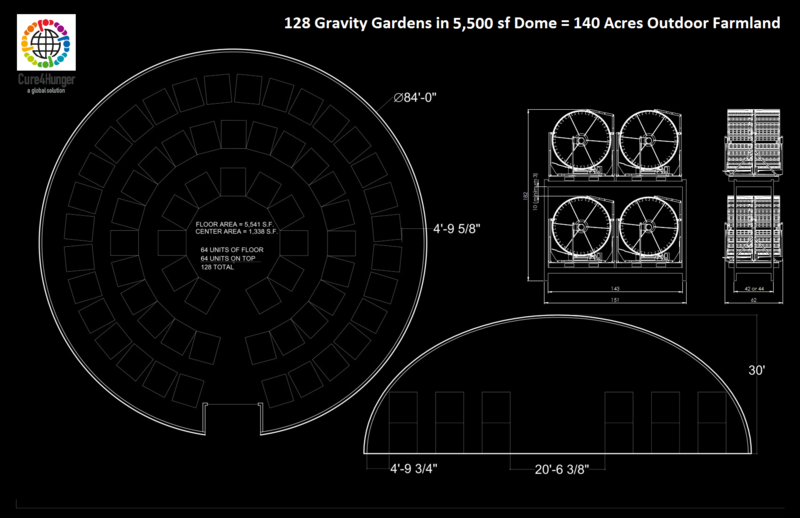 Reinventing the wheel actually applies to this equation of gravity, lumens light principle, best of the best nutrient solutions for every crop and the best growing environment in disaster proof domes has created the world’s first legitimate cure for global hunger with Food & Water Domes.Cure4Hunger Global Headquarters is the first Food & Water Dome to be funded and built in Newbury Park, CA. A 15-minute shuttle flight from LAX Airport is designed to invite media, press and most importantly the Food Service Provider Purchasing Agents and Buyers to show them how Cure4Hunger can replicate the same Dome anywhere in the world where they have customers. More than 3,000 fruits, vegetables, herbs, spices, plants, flowers and trees can be grown in Cure4 Hunger Systems more per square foot in recorded history.There’s a saying “Teach a person to fish instead of feeding them fish”. What happens when you have 1 million fishermen and only 10,000 fish in the water…?Previous Answer: Some will live yet most will starve even though they worked hard and still they starve. 2014 Answer: Build a Food and Water Dome once and it produces food day after day, month after month, year after year, decade after decade.This is where all of us have an opportunity to end global hunger once and for all. It is estimated by 2050 the earth will have 10 billion people on the planet. Without these 15,000 Food and Water Domes the people would not have enough food. The timing could not have been more appropriate.